The Martins Creek is a small to medium size stream that runs just south of the Poconos and north of Easton. Starting in the small town of Bangor, PA and running south to the village of Martins Creek this freestone stream is a hidden treasure. The stream is 15 to 30 feet wide and runs cold and clear for 90% of the year. It is fishable year round and has sections that are listed as Class A wild trout. 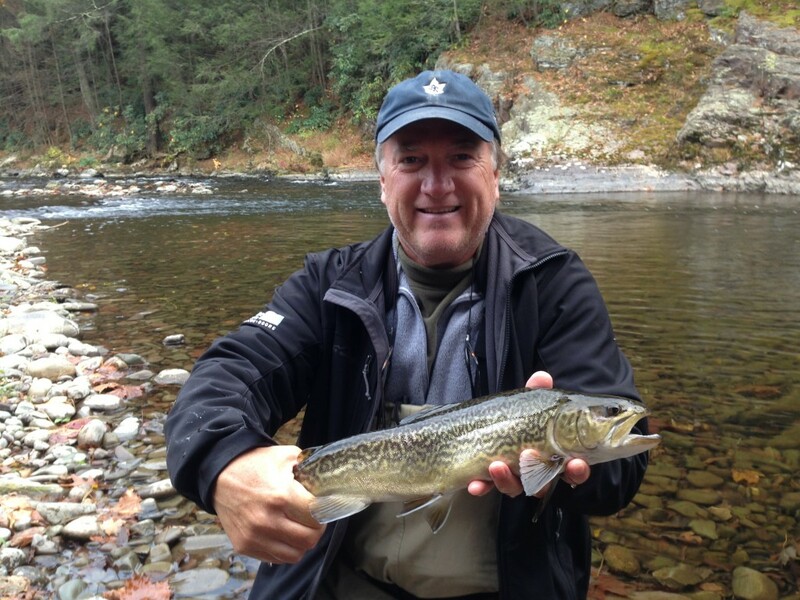 Throughout its length the Martins Creek has the ability to produce some surprisingly large wild trout. In its lower reaches they seem to be a bit more common since these fish may move in and out of the Delaware River at different times of the year. The Martins does not give up big fish on every trip, but when conditions are right they can be caught. This is one of our favorite wild trout streams. 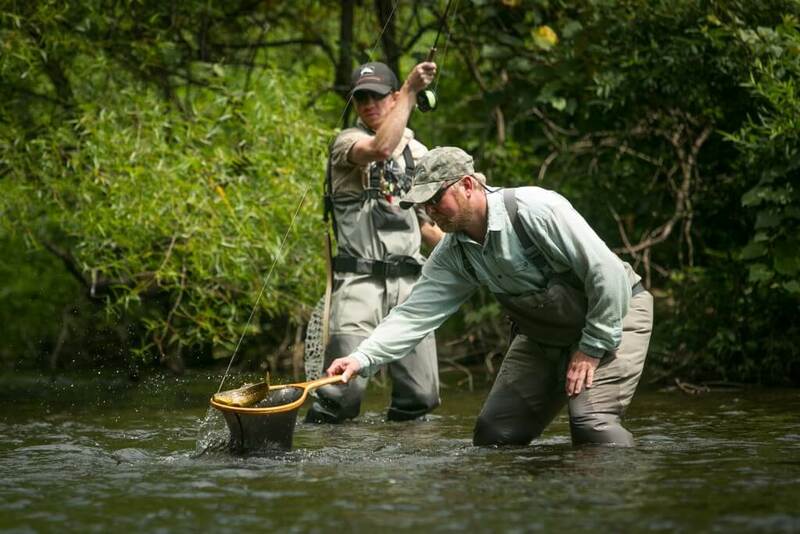 The Brodhead is the keystone of fly fishing in the Pocono Region. This is where fly fishing started in America and I am proud to call it my home stream. This large freestone stream is easily separated into three seperate sections. The upper end near Analomink is filled with large boulders and pocket water that will challenge anglers of all skill levels. The middle section flows through Stroudsburg and E.Stroudsburg and has many long pools and fast runs that have a smaller cobble stone rock bottom. The stream in this area changes from year to year and provides good dry fly fishing for most of the year. The lower end is a large gorge that is fairly inaccessible. This area has treacherous wading and deep water. It should be left to those who like an adventure and a challenge. Fishing in the lower section is about quality not quantity. A few nice fish inhabit these large deep pools and runs. There is a section of the Brodhead that will suit your fishing style and with its many hatches it will surely be a memorable fly fishing trip. 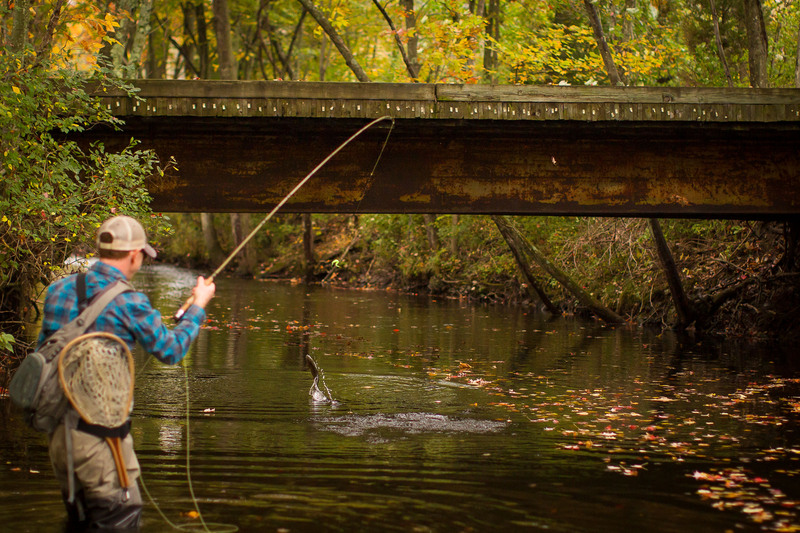 McMichaels Creek may not be as famous as its sister streams the Brodhead and Pocono Creeks, but it has been a local favorite for many years. The McMichaels doesn’t have a steep gradient like the Pocono and may not have the access of the Brodhead, but it has good hatches and a good population of wild and stocked fish throughout its entire length. Stroud Township has helped to create more access to this stream by purchasing land along its banks near Stroudsburg and the Glenbrook golf course. This area is a delayed harvest area and is well stocked and open to fishing year-round. There are also a few miles of creek near Stroudsburg that land owners allow fishermen to access and that is stocked by the state. 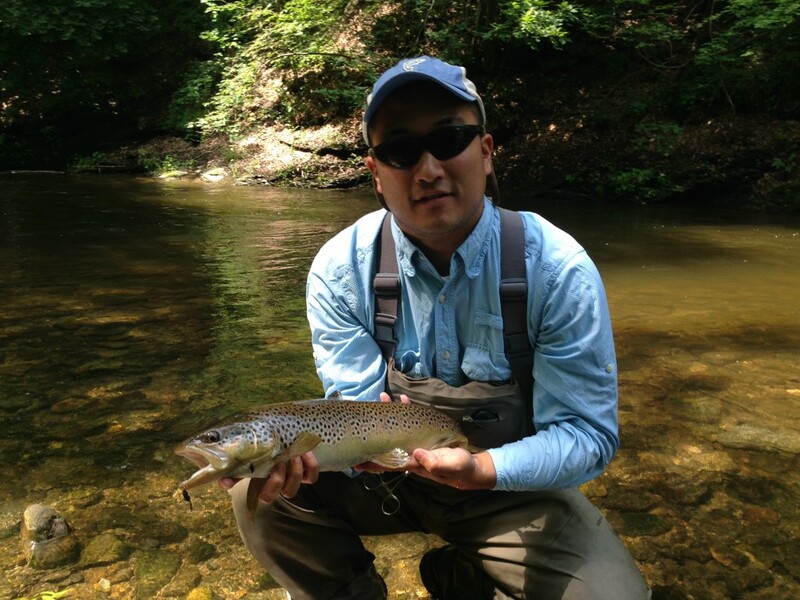 The creek provides many long pools for good dry fly fishing on many evenings during the spring and summer. The Sulphurs and Slate Drakes come to mind when I think of the McMichaels and some great catches as well. 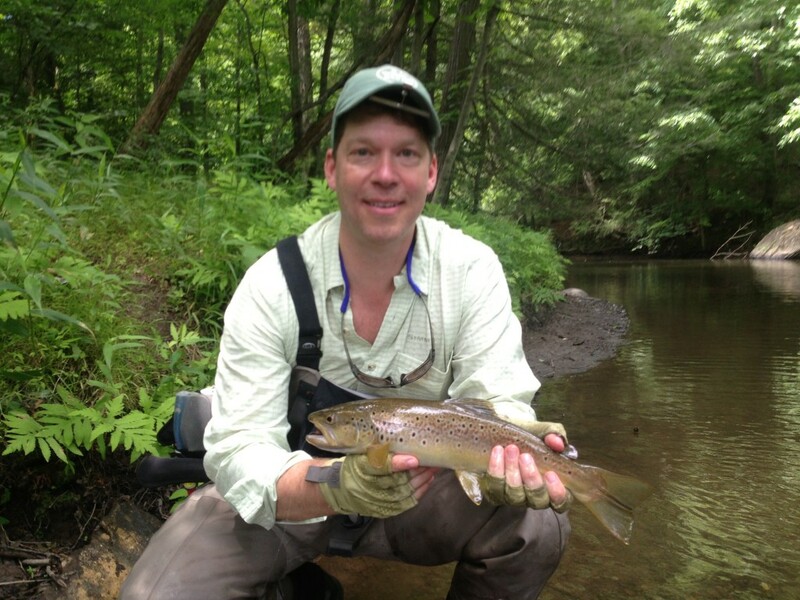 The nymphing in the riffles as well as the pools can be excellent throughout the year and the fall fishing on this stream can be the best in the area. This is an easy stream to wade and it fishes well most of the year. The Big Bushkill is noted as one of the most scenic streams in the Pocono Mountains. This is a large freestone stream that flows through rugged terrain on its way to the Delaware River. 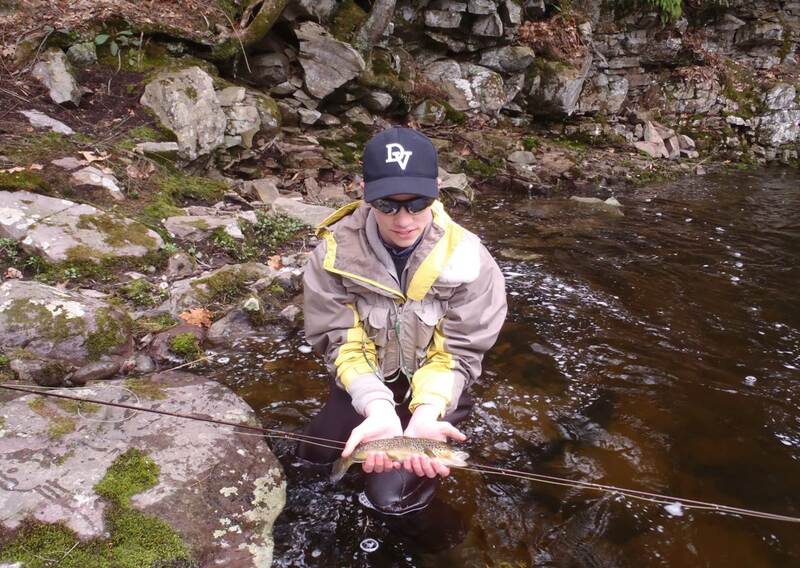 With a Delayed Harvest area at Resica Falls Scout Reservation, the Bushkill is open to fly fishing year round. Spectacular spring hatches of Blue Quills, Hendricksons, and Grannom caddis make this creek an early season must. Catch stocked and hold over fish in good numbers while enjoying the scenery and wildlife. Wading can be difficult and a wading staff is reccommended. The “Po” as we like to call it is one of the Poconos hidden little secrets. Located below the deep Beltzville Reservoir, this cold tailwater, provides us with a great wild brown trout fishery that is supplemented by the stocking of fingerling rainbows. Now the Po is not loaded with large fish but that fact can often be overlooked when you are catching numbers of healthy wild and hold over fish on dry flies or dry dropper rigs in crystal clear water in the middle of summer. A quality fishery year round, this stream should be in the back of every anglers mind when other streams are too low or too high to fish.